For the next several weeks, the participants in French Fridays with Dorie will be exploring our experiences over the past several years to answer a few interesting questions. This week’s challenge is to “choose your favorite, loved the most, best recipe in FFWD to share this week and tell Why? Also share with us your Top 5 favorites list”. Not surprisingly, this is turning out to be a difficult task. After hundreds of recipes – there are many choices. One of the most interesting things will be to read about what all of the others chose as well. Since we are a diverse and international group – I hardly think that the lists will be the same (though I suspect a couple will resonate across the board). And making things a bit more interesting over the next few weeks, there are a couple more challenges – The Never-Doubt-Dorie Moment and The Play-It-Again-Dorie Recipe, prior to our finale and last hurrah! from this particular book. Lots of potential for crossover! And I have to say, that as I look through the recipes, and when we made them, we really came out of the gate at a grand pace! Lots of contenders from 2010 and early 2011! And a warning: some not-so-great photos of some of my top favorites! At least I maybe have learned a bit more the just how to make some great French recipes! So, on to Candy’s Top Five Six! #5 – Hachis Parmentier. This was also a candidate for the Play-It-Again-Dorie category. I have made this quite a number of times, always to rave reviews. But this kind of dish, as something French was a revelation. I’ve made it in the different versions, and it still remains a staple. And of course, seeing it on the menu at French restaurants (once within a month or so of its first appearance) sealed it as a resounding favorite. 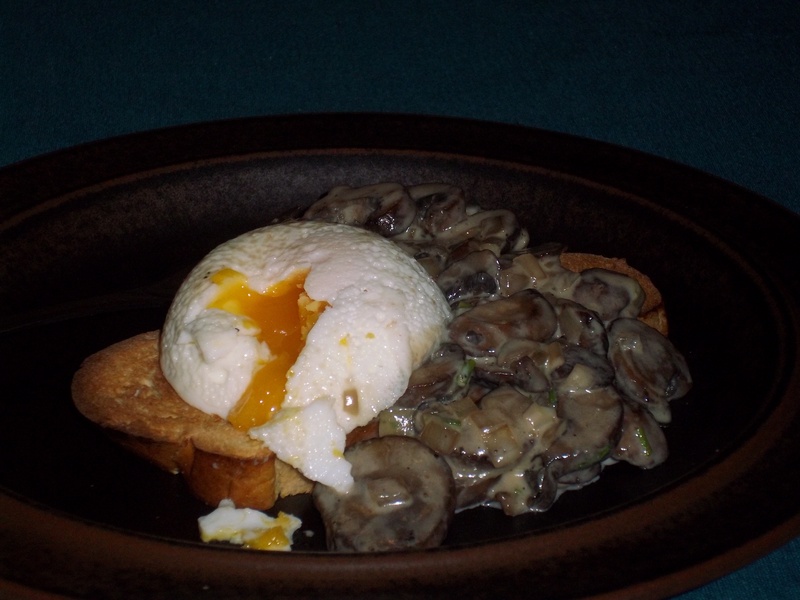 #4.5 – Creamy Mushrooms and Eggs. I almost forgot this. What an amazing dish! Perfectly cooked mushrooms with shallots, and added cream, with a bit of thyme. Served on toasted Brioche with soft poached eggs. This is a to-die-for dish. Rich yet simple, and utilizes a number of French techniques. Can’t believe I almost missed putting it on the list!! #4 – Scallops with Double Carrots. The original recipe called for Monk Fish. None to be had here – but good quality scallops can be found. The sauce created by using carrot juice in addition to carrots themselves – well, it made the dish. Oh, and you can’t go wrong with bacon and scallops either. It was a completely new idea to me to create a sauce that way, and so it was a great lesson learned. So creative! I can’t for the life of me find a photo. Really? Do a search – many images of other Dorista’s versions available! 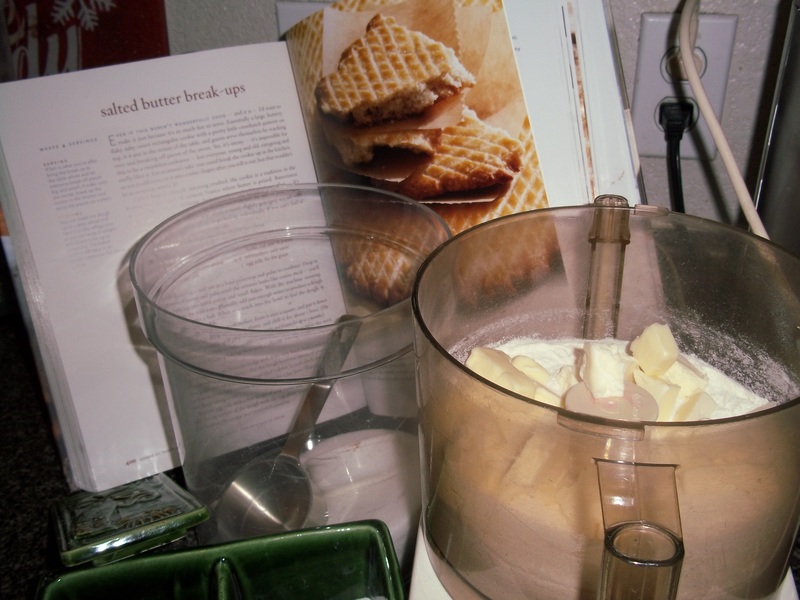 #3 – Salted Butter Break-Ups. No Dorie Greenspan book would be complete without an amazing dessert recipe. And even more quintessential, a cookie recipe. This recipe for oversized cookies that get broken apart at the table – well it makes for such a charming way of serving (assuming you are not surrounded by unreasonable germaphobes), but it also produces a dramatic, lovely and incredibly delicious cookie! Crunchy parts for those who love that – a bit more chewy for that preference. All in one cookie. Something for everyone! 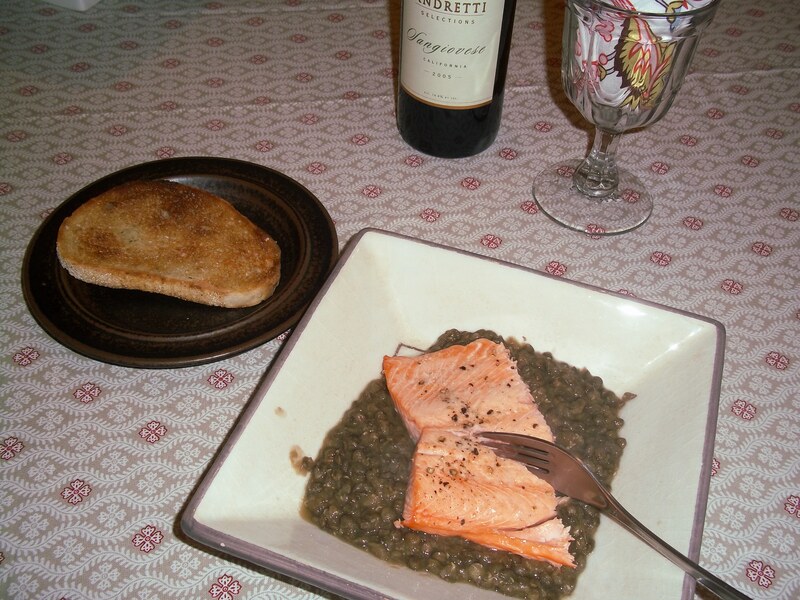 #2 – Roasted Salmon and Lentils. I am not a huge fan of salmon (unless I just caught it! ), and had never really had any lentils that I liked (or, let’s face it, tried many) until this recipe. Oh. My. Goodness! This recipe single-handedly made me a convert to Lentils de Puy, as well as salmon. It’s that good. The lentils are perfectly seasoned, the salmon cooks perfectly, it’s hearty, healthy and very elegant in a French manner. 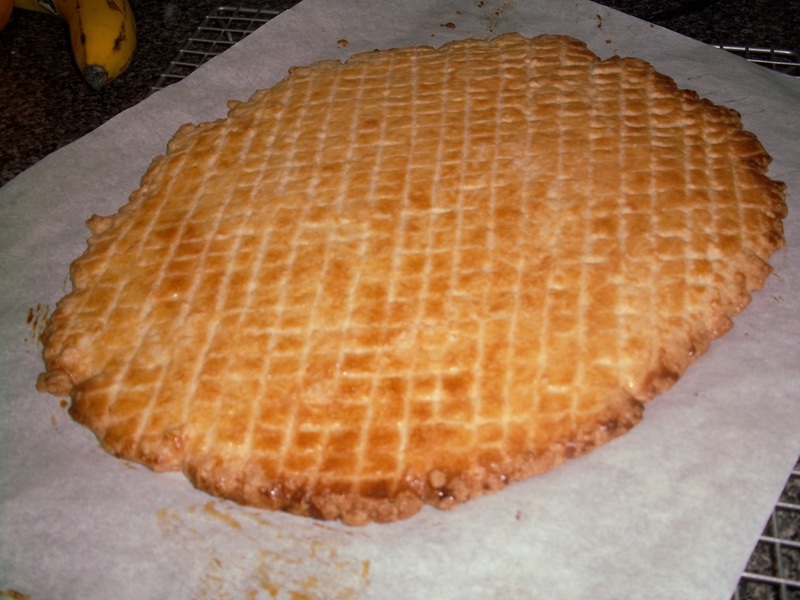 #1 My Favorite, Best Recipe is: Marie-Hélène’s Apple Cake. I thought about this a lot. But decided that this typically French apple cake, with it’s marked butter flavor, bursting with apple chunks got my vote. 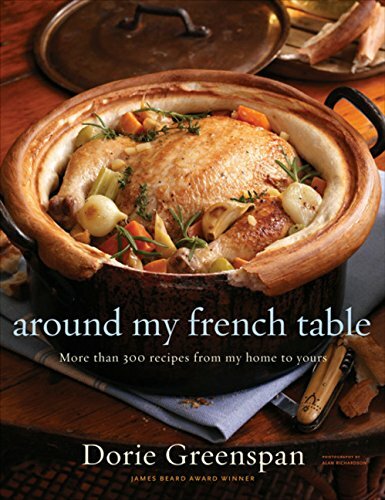 Yes, its relatively simple, but it seemed to embody the idea of a meal around Dorie’s French table. This was a fun journey back in time to re-visit posts, what I thought, and also, what I thought was good enough to make again. All of these dishes fall well outside of the category One-And-Done. And while I had to rely on the original photos (or none at all! ), they all offered something so good, that I was willing to brave the reminder of some pretty poor photography skills! There is a celebratory air around the French Fridays with Dorie group, you can get a peek into all of the participants’ posts at the site. 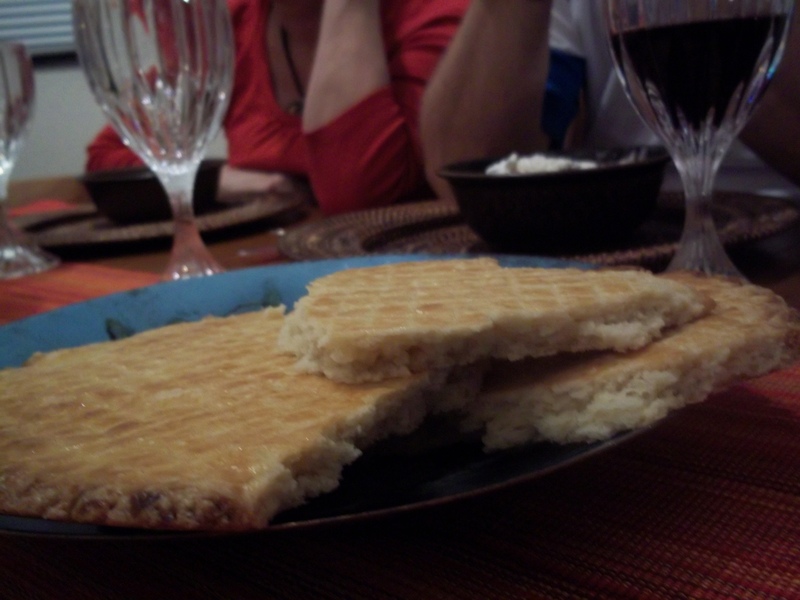 Posted on May 29, 2015 May 29, 2015 by dulceshomePosted in Baking, Desserts, French Fridays with Dorie, main dishTagged apple cake, apples, brioche, cookies, hachis parmentier, lentils, mushrooms, salmon. Wonderful collection. I just got reminded of the eggs and mushroom dish because my daughter made brioche for it. That was really terrific and simple. I am going to make it soon. Thanks for jogging my memory on some fine recipes. Great list! It is fun to see favorites from each person! Great choices, Candy! Did you know that your #1 in the Food52 Genius Recipes? I like how you snuck #4.5 in there! It’s really hard to narrow it down, isn’t it? I like how everyone’s list is different. I did not, Betsy! That’s fun. I’m so excited to see what everyone else chose. I have to read more, but I did get an idea for my final one from your post…we’ll see!!! You little sneak with the #4.5! I love Marie Helene’s Apple Cake, too. I ate lentils and beets for the first time thanks to AMFT. And your #1 is just one of those universally loved recipes from the book. I had those creamy mushrooms and eggs in my list too. One of the more versatile dishes if you ask me and I love making it on weekends. Great choices! Great choices, Candy! I think The Apple Cake has made it onto a lot of lists this week! A truly delicious cake. I think I have to rethink my list! Have a great weekend! The apple cake is proving to be the most popular dish, it seems, followed by the short ribs. You made some great choices! I love your 4.5 – sneaky! I have to admit I was very undisciplined in my list, but had a lot of fun putting it together. I love your list. We love salmon and lentils and actually made it before discovering it in AMFT. I need to make that apple cake as it has made a few lists. I need to look into Hachis Parmentier as that has not hit my radar yet. Have a great week and see you next Firday. I loved the scallops with carrots and the apple cake too. 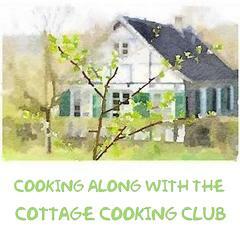 So many delish recipes, so hard to narrow down to just five. Scallops and double carrots is genius! I’m going to have to try that since I have great scallops here! 😉 There was a lot of crossover on my lists too so I wound up just writing one celebration post but it seemed fitting for me! 🙂 The Hachis Parmentier is another great one! I want to make that soon at our house! What a fun list! The apple cake seems to be a consistent favorite. I loved the double carrots too. Great list! Those carrots from the monkfish/scallop recipe were good, weren’t they? I keep meaning to make them again on their own for a side dish. That apple cake nearly made my top desserts list…if I had made the list one longer it would have been there! That mushroom and eggs recipe really was delicious. I’m wondering now how it’s possible that I only made it once. Great list, I loved all of these.